This epic follows the trials and tribulations of three generations of a frontier family as they embark to tame the wild American West. 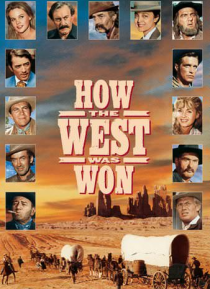 Narrated by the great Spencer Tracy, it features a cast that includes John Wayne, Gregory Peck, James Stewart, Henry Fonda, Debbie Reynolds, Richard Widmark, Lee J. Cobb, George Peppard, Raymond Massey, Robert Preston, Karl Malden, Eli Wallach & Carrol Baker. Helme… d by three acclaimed directors, including John Ford. Inducted into the Library of Congress National Film Registry.